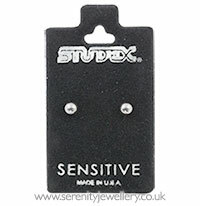 Studex Sensitive hypoallergenic surgical steel 3mm, 4mm and 5mm ball stud earrings with surgical steel butterfly backs. I have been wearing them for weeks now and they are great! Wanted a pair I could wear constantly and not have to worry about tarnishing. Easy to wear, take a bit of work to get off sometimes, but hey, at least I won't lose them. These are small neat & comfy to wear. Look like silver. I find the butterfly a bit tight to fasten but at least I won't lose it! 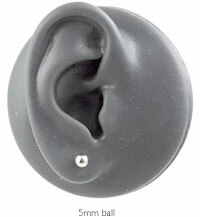 Great studs as an alternative to silver. Bought for my daughter to wear to school as she has been advised to wear surgical steel earrings for 6 months (post 6 week Studex piercing earrings). Perfect earrings and quick delivery by Serenity. Over the past couple of years I've tried to wear silver stud earings. They have never stayed silver! So decided to try the surgical studs. They are great. Look like silver and have the locking posts. Great product at a good price. After years of thinking I could only wear gold earrings, the studex sensitive range have certainly made my purse heavier - very reasonably priced. And great service yet again. First time my daughter has been able to wear earrings comfortably since having had them pierced. these are brilliant.i have very sensitive ears and i,m glad i purchased these.highly recommend.thanks.